Two Steve Reich compositions on this disc. 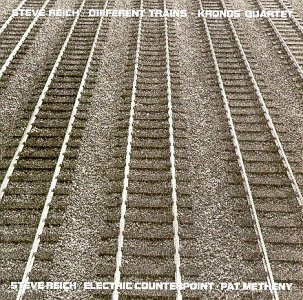 The first three tracks belong to "Different Trains" and are performed by the Kronos Quartet, whereas the latter 3 constitute "Electric Counterpoint" and is primarily performed by jazz guitarist Pat Metheny. (1988) For string quartet and tape begins a new way of composing that has its roots in my early taped speech pieces It's Gonna Rain (1965) and Come Out (1966). The basic idea is that speech recordings generate the musical material for musical instruments. 1 - Record my governess Virginia, now in her seventies, reminiscing about our train trips together. 2 - Record a retired Pullman porter, Lawrence Davis, now in his eighties, who used to ride lines between New York and Los Angeles, reminiscing about his life. 3 - Collect recordings of Holocaust survivors Rachella, Paul and Rachel - all about my age and now living in America - speaking of their experiences. 4 - Collected recorded American and European train sounds of the 1930s and 40s. The strings then literally imitate that speech melody. The speech samples as well as the train sounds were transferred to tape with the use of sampling keyboards and a computer. Kronos then made four separate string quartet recordings which were combined with the speech and train sounds to create the finished work. Different Trains is in three movements, though that term is stretched here since tempos change frequently in each movement. They are: America-Before the war, Europe-During the war, After the war. The piece thus presents both a documentary and a musical reality, and begins a new musical direction. It is a direction that I expect will lead to a new kind of documentary music video theater in the not too distant future. The soloist pre-records as many as ten guitars and two electric bass parts and then plays the 11th guitar part live against the tape. I would like to thank Pat Metheny for showing me how to improve the piece by making it more idiomatic for the guitar. Electric Counterpoint is in three movements - fast, slow, fast - played one after the other without pause. The first movement, after and introductory pulsing section where the harmonies of the movement are stated uses a theme derived fro Central African horn music that I became aware of through ethnomusicologist Simha Arom. That theme builds to an eight-voice canon; while the remaining two guitars and bass play pulsing harmonies, the soloist plays melodic patterns that result from the contrapuntal interlocking of those eight pre-recorded guitars. The second movement cuts the tempo in half, changes key and introduces a new thee which is then slowly built up to nine guitars in canon. Once again, two other guitars and bass supply harmony while the soloist brings out melodic patterns that result from the overall contrapuntal web. The third movement returns to the original tempo and key and introduces a new pattern in triple meter. After the establishment of a four-guitar canon, two bass guitars enter suddenly to further stress the triple meter. The soloist then introduces a new series of strummed chords that are then built up in three-guitar canon. When these are complete, the soloist returns to melodic patterns that result from the overall counterpoint. Suddenly the bases begin to change both key and meter back and forth between E minor and C minor and between 3/2 and 12/8 so that one hears the first three groups of four eighth-notes and then four groups of three eighth-notes. These rhythmic and tonal changes occur more and more rapidly until, at the end, the basses slowly fade out and the ambiguities are finally resolved in 12/8 and E minor.